In loving memory of the men of Tallapoosa County who made the supreme sacrifice. 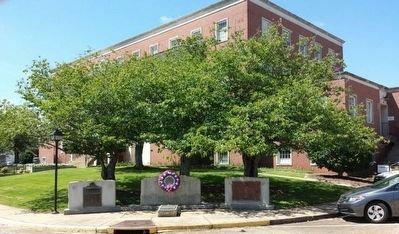 Erected by American Legion Posts and Auxiliary Units of Tallapoosa County in Alexander City, Camp Hill and Dadeville. Location. 32° 49.879′ N, 85° 45.831′ W. Marker is in Dadeville, Alabama, in Tallapoosa County. Marker is at the intersection of North Broadnax Street (Alabama Route 49) and West Cusseta Street, on the right when traveling south on North Broadnax Street. Touch for map. Marker is at or near this postal address: 125 N Broadnax St, Dadeville AL 36853, United States of America. Touch for directions. Other nearby markers. At least 8 other markers are within walking distance of this marker. 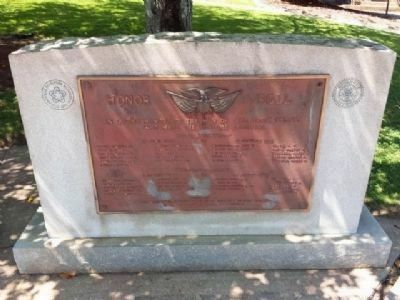 Tallapoosa County World War II Memorial (here, next to this marker); Battle Of Horseshoe Bend (here, next to this marker); Tallapoosa County World War I Memorial (here, next to this marker); Johnson J. Hooper (within shouting distance of this marker); Tallapoosa County Peace Officers (within shouting distance of this marker); Alabama Mills WWII Memorial (within shouting distance of this marker); Fletcher Napoleon Farrington, Sr. (about 500 feet away, measured in a direct line); First Baptist Church (about 600 feet away). Touch for a list and map of all markers in Dadeville. More. 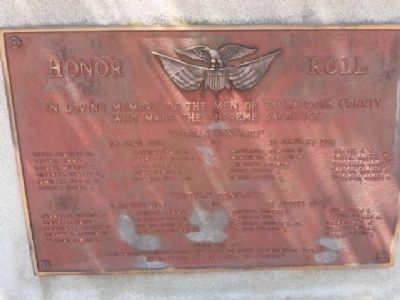 Search the internet for Tallapoosa County Korean & Vietnam War Memorial. Credits. This page was last revised on June 25, 2018. This page originally submitted on August 24, 2013, by Mark Hilton of Montgomery, Alabama. This page has been viewed 481 times since then and 2 times this year. Photos: 1, 2, 3. submitted on August 24, 2013, by Mark Hilton of Montgomery, Alabama. • Bernard Fisher was the editor who published this page.